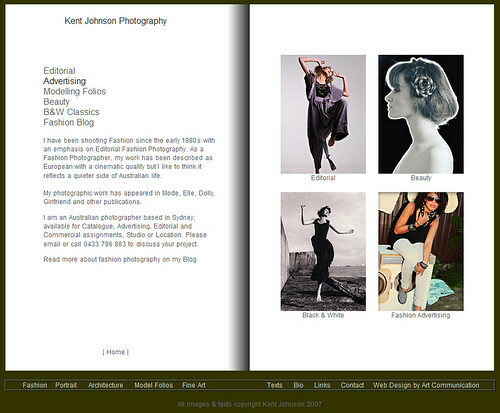 Editorial Fashion, Fashion Advertising & Model Folios Too. Well I may have already blogged some of the shots from various shoots over the last few months but the Web site itself was looking a little tired and in need of some new images. For the last four days I have been working on editing, re-processing, re-sizing, re-ordering and finally replacing quite a lot of pictures on the Fashion Pages of the web site. Its always a daunting task but one that is very worthwhile. Both the Fashion Editorial and Fashion Advertising galleries on the website have never looked better and are showing my vision for fashion photography much more clearly. There are a couple of projects that have been in the planing stages for quite a while that are about to 'come off' so now is a good time to check out the web site before some of the old favorites disappear back into the archive. The Beauty Photography gallery has had a bit of a make over with some lovely new images that have not been on the site or the Blog before. I have also added some of the Notorious; yes these shots do seem to be gaining some notoriety... Frankie's Nightclub Campsie shots. For those of you who are not aware, there is no Frankie's! So please, stop emailing me for the address :~)) Its an Art Project, a kind of myspace thing, but there will be more about that later. Frankie's lovers might like to check out the Modelling Portfolios pages; just because you can. So if you have only been following the blog, please click the links and take a tour of the site, there is much more wonderful photography to be seen. 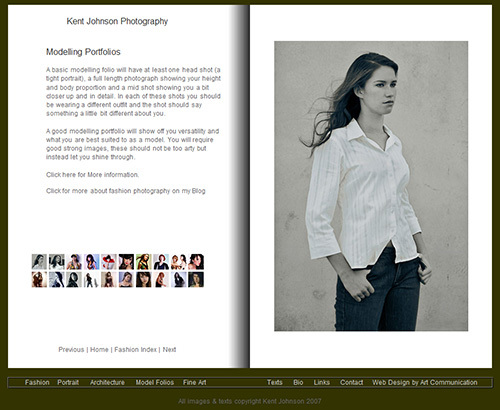 And of course; the whole point of the exercise is to entice you to commission me to shoot your Fashion for you. Great shots make for great web-sites, catalogues, look-books, promotions and lots of sales! New Designers, New Fashion in Sydney. There is some great young fashion design talent in Sydney and quite a bit of it seems to be residing, or should that be studying at Ultimo TAFE, at least if last weeks Evening Gown Parade at the Strand Arcade is anything to go by. 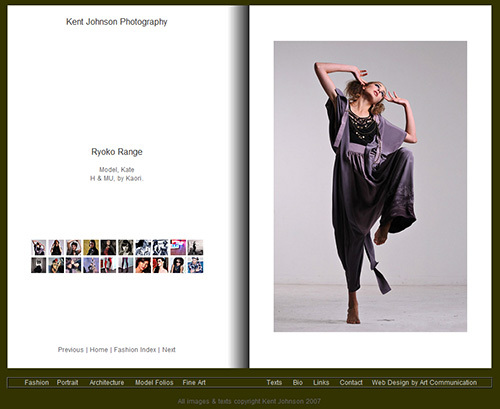 A little under a year ago I was approached by one of the TAFE fashion students about shooting her second year range. We met up so I could take a look at her designs. They were fine but there were only three solid outfits and they still had something of a student feel to them. I asked her to get back to me when she had her graduation range ready in 2008. And so she did. Ryoko sent me a PDF drawing of her graduation range and I was sold immediately. What a difference a year makes! After seeing the drawings I called in a few favours, booking The Photo Studio in Glebe and enlisting two wonderful models, Kate & Joseph from Viviens to create the sort of photo shoot Ryoko’s range clearly deserved. The range shows Ryoko’s Japanese influences in the fine fabric details (she is out from Japan studying design here in Sydney). The loosely structured garments were a pleasure to photograph. A big thankyou to everyone who gave their time and effort for the shoot. The Models Kate & Joseph and the booking team at Viviens. North Sullivan for The Photo Studio; Kaori with Hair & Make-Up and Ryoko for her fabulous designs.